Yesterday, January 5, 2018 was 80th birthday of Spanish former King Juan Carlos. Spanish Royal Family celebrated 80th birthday of King Juan Carlos with a special lunch at Zarzuela Palace in Madrid. 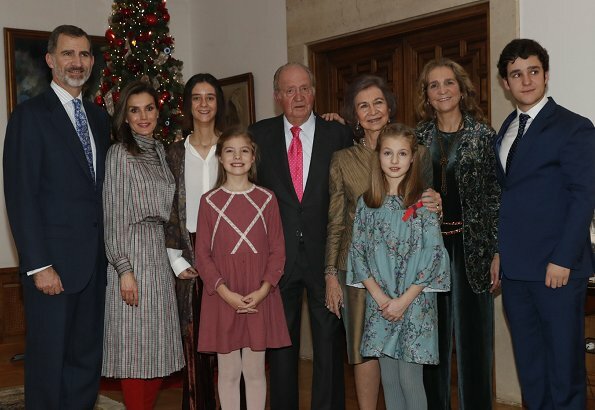 Queen Sofia, King Felipe, Queen Letizia, Princess Leonor, Infanta Sofia, Infanta Elena, Victoria Federica, Froilán Marichalar and about 70 royal family members attended the lunch. Infanta Cristina and her children could not attend the lunch because they were in Rome. Sad to see Cristina's children do not participate in their grandfather's 80th birthday together with their cousins ​​​...... but we know the reason, why the family is in Rome and not in Madrid. How old are Leonor and Sofia? I think it´s time to let go of these little girl dresses (that weren´t especially nice-looking anyway). Also, Letizia looks weirdly retro, as if she got "inspired" by Victoria. I was just thinking the same when I saw Leonors and Sofias dresses. Me too, that was my first thought. I'm sure there are more age-appropriate dresses for 11 and 12 year-olds. Here I agree with you totally. So weird to see girls at age 11 and 12 having short "baby clothes". Leonor is such a beautiful child. She is a combination of her Grandmother, Sofia, and her Mother. I love the girls' dresses. Cristina and children were invited however her husband wasn't so Cristina decided to stand by her man. I thought her husband is in prison? He was sentenced to 6 years of prison, but he's free as a bird. Of course he's married to a royal and Spanish justice doesn't cross that line. Not yet. I think he is free while it is under appeal. Urdangarín está sentenciado e irá a la cárcel cuando e Tribunal Supremo resuelva su apelación y se ha pedido aumento de la pena. Para ya con tus embustes y tu manipulación, Kteach, que tampoco tu ex-honorapla está en chirona ni la madre superiora tampoco. I like Letizia's dress. Maybe it's a bit retro but she makes it work. And are those her stunning red boots? The girls' dresses are charming. I'm sure they are old enough to exert some influence on what they wear and their mother is certainly fashion-forward enough to know what is best for their age and in their milieu. It's great to see children not rushing to dress as adults. Their dresses are not dissimilar from the size and cut of Queen Maxima daughters. I love the retro style and it's definitely in even if not for everyone. She pulls it off. As the girls are 10 and 12, I think this is the last year you will see them in these type of dresses.